To download one of our tool libraries, head to https://cam.autodesk.com/hsmtools. 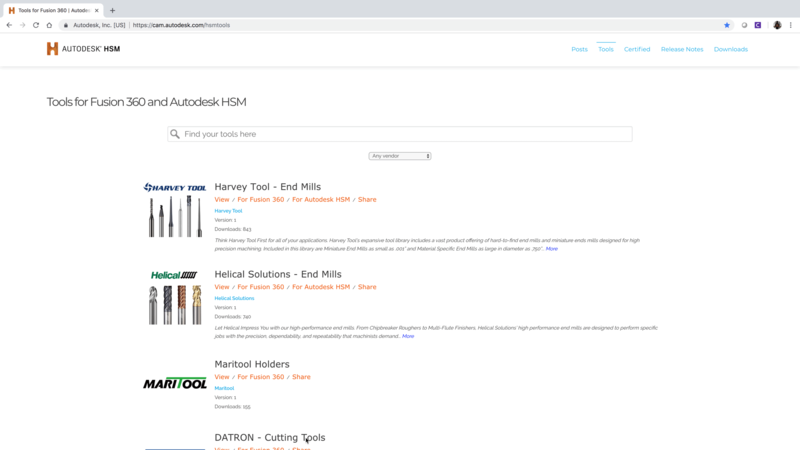 There you will find all of the Harvey Tool and Helical Solutions tool libraries. You will be able to sort by vendor or use the search bar to filter results. You will see two options listed: “For Fusion 360” and “For Autodesk HSM”. To download your HSM tool library, choose the “For Autodesk HSM” option. This will trigger an .HSMLib file to download into your computer’s Downloads folder. You can also find a direct link to our tool libraries in the webpage above, or by clicking the links below. Once you have downloaded your HSM tool library, you will need to import the tool libraries into your HSM software by heading to the “My Libraries” tab and right-clicking and selecting “Open in Window Explorer”. From there, navigate to your Downloads folder on your computer, and select the tool library files you have downloaded to add them to your HSM library.